Allogeneic hematopoietic stem cell transplantation (HCT) has been widely used to treat both malignant and nonmalignant hematological disorders. Despite remarkable success, one complication that occurs in up to approximately 50% of patients undergoing allogeneic HCT is graft-versus-host disease (GVHD), of which there are two forms. These are acute GVHD, usually developing within 100 days, and chronic GVHD, developing 100 days and beyond after HCT. Both are the result of immune reactions of donor lymphoid cells to cellular targets on host tissues. Unfortunately, chronic GVHD may last several years and is difficult to treat. The major target organs for GVHD are the skin, gastrointestinal (GI) tract, and liver. Although the incidence and severity of liver GVHD has been reduced with ursodiol prophylaxis, chronic skin and GI GVHD are often refractory to immunosuppressive drugs and can severely impair a patient’s quality of life, and causing serious infections that can be fatal. Although treatment or prevention of acute GVHD has been remarkably successful with post-grafting immunosuppression regimens and corticosteroids, treatment of chronic GVHD has lagged. This has been partly due to an insufficient development of appropriate animal models that recapitulate the full spectrum of chronic GVHD in patients, allowing for a comprehensive evaluation of therapeutic agents. Recently, we reported the reproducible establishment of chronic GVHD in an outbred canine model. The transplanted animals developed identical, complex clinical symptoms and histopathological findings in the same target organs as seen in human patients. 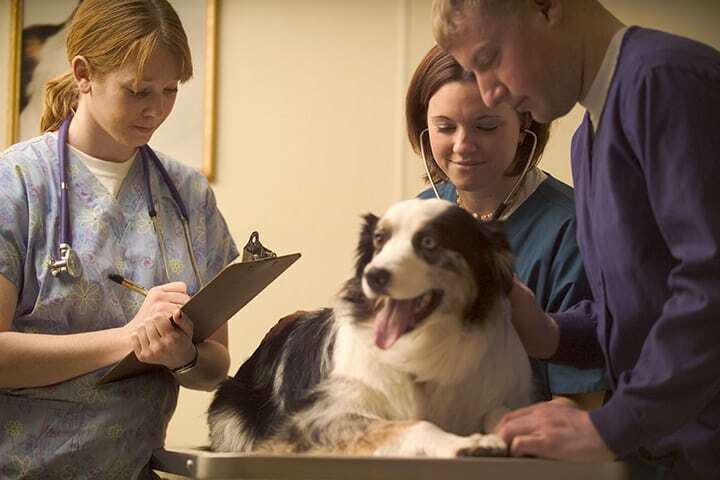 Thus, canines provided an appropriate animal model with which to test novel therapeutics for the treatment of chronic GVHD. One current area of intense therapeutic interest to immunologists is the manner in which cells of the immune system signal one another in response to antigen presentation, expansion and differentiation, or cell senescence and death. These studies are particularly applicable to T cells that carry out a number of important immunological functions, including helper activity to other immune cells, suppressor function, and cytolytic activity. T cells are also critically involved in the pathology of GVHD. In both theory and practice, our ability to interfere or enhance the receptor-based signaling process in the immune response has led to new biologics and drugs that can activate or suppress the immune system for a variety of diseases including cancer and autoimmune disorders. Development of new therapies should encompass a central goal of transplantation, namely to identify methods that produce unresponsiveness to transplanted tissues without limiting the entire immune response. Of particular interest are costimulatory molecules that are pairs of receptors and their cognate ligands found on cells of the immune system that are constitutively expressed or induced (upregulated) following cell activation. 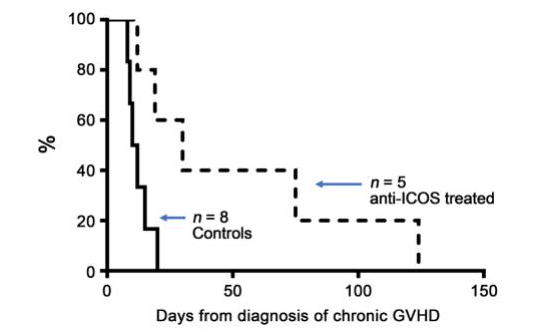 On T cells, inducible costimulator (ICOS) is upregulated following cell activation including during the development of GVHD. The role of ICOS is to help initiate T cell activation when interacting with antigen presenting cells. In the presence of IL-2, ICOS acts to sustain the immune response. Therefore, it follows that blocking ICOS signaling on T cells, the primary orchestrators of GVHD, might halt and potentially reverse chronic GVHD without debilitating the immune system in general. With this hypothesis in mind, we employed the canine model of chronic GVHD and used a canine-specific mouse monoclonal antibody (mAb) produced against the extracellular domain of canine ICOS. Preliminary in vitro studies indicated that anti-ICOS mAb blocked ICOS signaling in canine peripheral blood lymphocytes. In our chronic GVHD model, 4 of 5 dogs treated with only three injections of anti-ICOS over a 6-day period halted the progression of GVHD. Notably, gingival tissues returned normal and skin lesions regressed resulting in a survival period significantly greater than the control group that did not receive anti-ICOS therapy. Because the antibody was of murine origin, the dogs were capable of mounting an immune response against the foreign protein, thus limiting the number of treatments the animals received. In the human condition, an antibody can be made to appear human antigenically, and multiple treatments could easily be administered without limitations due to anti-mAb immune responses. MEDI-570 is a humanized anti-ICOS mAb and is used clinically to treat cancers expressing the ICOS receptor. Clinical studies testing the ability of anti-ICOS to treat chronic GVHD in patients are certainly feasible using MEDI-570. These findings are described in the article entitled Anti-Inducible Costimulator Monoclonal Antibody Treatment of Canine Chronic Graft-versus-Host Disease, recently published in the journal Biology of Blood and Marrow Transplantation. This work was conducted by Scott S. Graves, Maura H. Parker, Diane Stone, George E. Sale, Smitha P. S. Pillai, Melissa M. Johnson, and Rainer Storb from the Fred Hutchinson Cancer Research Center. Scott S. Graves is a senior staff scientist at the Fred Hutchinson Cancer Research Center in the Division of Clinical Research. He has expertise in immune tolerance mechanisms, co-stimulatory molecule blockade, molecular biology, genetic typing, pre-clinical animal modeling and graft versus host disease. In his lab, they conduct hematopoietic cell and kidney transplantation studies, assist in surgery and animal medical care, and protocols, produce and test in large animal model monoclonal antibodies and fusion proteins.